Dave Winkel was born on March 10, 1931, in Sibley, Iowa. He was raised in this small farming community, as Dave gratefully puts it, by the right set of parents in the right sort of community at the right time. He graduated from Iowa State University in 1952 with a B.S. in chemistry and botany. To the consternation of his undergraduate advisor, he took courses in machine shop and foundry. His college experience left Dave with a love of science, engineering, and teaching. He earned the Ph.D. in physical chemistry at Iowa State in 1957 with research on electron field emission from iridium surfaces. His shop skills proved invaluable in his research. In 1957, Dave joined the Chemistry Department at the University of Wyoming, fulfilling a long-time wish to live in Wild Wyoming. He established a research program in surface chemistry and developed a theory of pendant drop for measuring surface tension in liquid metals. He computed tables of pendant drop using a Bendix G15 magnetic-drum computer, which contained all of 2000 words of memory. He was promoted to associate professor in 1962 and to professor in 1967. In 1962-64 he was visiting professor at Indiana University in Harrison Shull and Stanley Hagstrom’s quantum chemistry group, where he used the university’s IBM 709 computer to solve the Schroedinger equation for diatomic molecules. Here he developed a fascination with digital logic and computer architecture that was to set the direction of his professional life. Upon returning to the University of Wyoming in 1964, he founded the university’s computing center and became its first director, a position he held for twelve years. With funds from the university and the National Science Foundation, Dave acquired the university’s first large-scale computer, a second-hand Philco 211. In 1969 Dave received a grant to replace the Philco computer with a Sigma 5 time-sharing computer, which for the first time gave large numbers of students access to computing capabilities. Another grant allowed upgrade of this computer to a Sigma 7, with 32 simultaneous time-shared ports. For years, Dave kept these machines running using his growing skills at digital logic and mechanical fabrication. In 1966 Dave’s summer spent at Bell Telephone Laboratories resulted in publications on the computation of electron diffraction from surfaces. 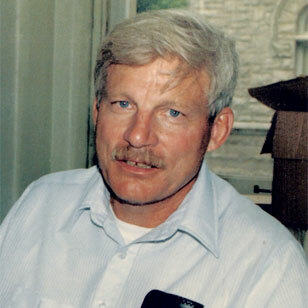 In 1971 Dave founded the University of Wyoming’s Computer Science Department and became its first head while retaining his directorship of the computing center. He left the computing center in 1976 to devote full time to computer science. Pursuing his interest in design methods for digital hardware, in 1967 Dave developed the theory of mixed logic that has played a central role in allowing hardware designers to separate the logical properties of problems from the voltage behavior of circuits. By 1970, Dave’s fascination with digital design led him to develop the LD14 laboratory kit to allow students to gain laboratory skills in hardware design. He formed Logic Design Inc to build and distribute his digital design technology and pedagogy. Dave’s course in digital design was the first in the country to have undergraduate students build a complete and functional digital computer from basic hardware components. After constructing several interfaces between computers and peripheral devices, Dave had developed an earnest wish for a general-purpose device controller to replace the multitude of device-specific interfaces then available. By 1975, this yearning had crystallized into the ideas for his Logic Engine. At that time Franklin Prosser, whom Dave had met at Indiana University in 1962, was on sabbatical leave learning digital hardware design. Dave directed Prosser in the design and construction of the prototype Logic Engine -- the first microprogrammable hardware development system. Dave’s supervision of Prosser’s sabbatical blossomed into a collaboration that would continue to this day. During his sabbatical leave at Indiana University in 1976-77, Dave wrote a manuscript on digital design, and with Prosser wrote The Art of Digital Design, which has been a leading textbook espousing principles for structured hardware design. Dave and Prosser are currently rewriting the book for a third edition, incorporating asynchronous design methods that they learned while on a joint sabbatical leave at the University of Utah in 1993-94. Leaves of absence to Indiana University in 1971-72 and 1976-77 and summer visits in 1980 and 1981 had given the Computer Science Department vivid glimpses of how Dave generated excitement and activity among students and faculty wherever he was, and in 1984 Dave moved to Indiana University as Professor of Computer Science. At Indiana University, Dave established Indiana University’s world-renowned digital hardware instructional laboratory and supervised the design and construction of several generations of Logic Engines and associated pedagogy. From 1986 through 1991 Dave directed the department’s first major grant, awarded under the National Science Foundation’s Coordinated Experimental Research program. Dave married June Bartz in 1953. They had three children, John, born 1954, Mark, born 1957, and Karla, born 1960. Dave and June purchased a log cabin and three acres outside Laramie in 1958. Dave would live there until his move to Indiana in 1984. Dave remarried in 1984, to Judy Vali, who has been his loving companion and a delight to Dave and his friends. A 1938 National Geographic article on sailplanes triggered Dave’s lifelong interest in soaring. He worked for two years to save money for the first installment of a glider kit before his parents vetoed the idea. He got his first glider ride in 1961 and immediately formed a glider club. He earned his glider and power-plane licenses in 1962. In later years he has owned several sailplanes and power planes. He has competed in ten national soaring championships. He established the Indiana single and multiplace sailplane records for distance, and holds the Colorado Governor’s Cup. As his friends know full-well, Dave is a non-stop doer. He is an accomplished machinist, astronomer, telescope lens grinder, watchmaker, inventor, hiker, bicyclist, and gardener. He is unselfish and enthusiastic about helping others develop their skills and interests. At this time he is working to preserve the ecology of the family farm in Iowa, rewriting his textbook, learning microbiology and genetics in a desire to study the molecular biology of orchid endophytic fungi, actively participating in the local soaring club, and continuing to speculate on his plans to clean up his workshop. Dave’s Indiana friends are delighted that he and Judy are planning to remain in Bloomington.